The Lannisters of Casterly Rock have worked their way into a powerful position at the heart of the realm. Their authority, however, is questioned by many, including the Brotherhood Without Banners who threaten from without, and Tyrion Lannister and his mountain clansmen, who threaten from within. 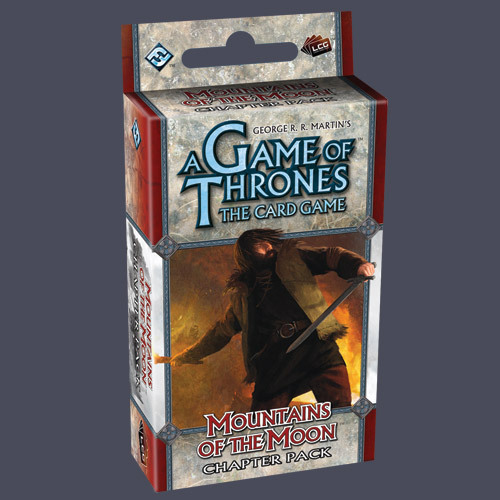 Mountains of the Moon is the third monthly installment of 60 fixed cardsâ€“3 copies each of 20 different cardsâ€“for the Brotherhood Without Banners expansion to A Game of Thrones: The Card Game. The never-before-seen cards in this expansion were designed to augment existing decks and add variety to the A Game of Thrones metagame. A A Game of Thrones LCG core set is required to play. Contains cards 41-60 of the Brotherhood Without Banners cycle.